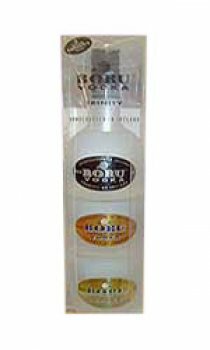 The trinity set comprises of Boru black, orange and citrus flavoured vodka. Brian Boru was a man of formidable strenth and character and is fully deserved of the eugilistic tiltle - Brian, Emperor of the Irish. As peacemaker, visionary and braveheart, Boru was the charismatic first high King of Ireland who laid down his life in a victorious battle on Good Friday, 1014 AD. Inspired by Boru is this crystal clear vodka, hand-crafted from 100% grain, with care and pride using pure Irish water and a unique, charcoal purification process. After quadruple distillation, Boru vodka is gently filtered through ten feet of Atlantic Irish oak charcoal for unsurpassed purity. They claim there is no purer vodka available in the world today.